Does DraftKings' New Sportsbook Mean Online Is Coming To Mississippi? Does DraftKings’ Brick-And-Mortar Sportsbook Mean Online Betting Is Coming To Mississippi? The two leading daily fantasy sports providers, DraftKings and FanDuel, have been very effective so far in jockeying for position in U.S. sports betting expansion against major, established gambling brands. FanDuel made the first move, landing a coveted branding position at the Meadowlands Racetrack’s sportsbook. Then rival DraftKings was first to market with online sports betting in New Jersey, grabbing the early lead in that space. Now DraftKings has joined FanDuel in opening a brick-and-mortar book — but it’s not in New Jersey. It’s at the three-year-old Scarlet Pearl Casino Resort in the southeastern Mississippi Gulf Coast town of D’lberville. DraftKings plans to have its revamp of the former PRL Bar (pictured above) into a sportsbook ready to take bets on Friday. Still, FanDuel retains certain edges, not only by being in a heavily-populated region in a much more populated state, but by having a synergy between its brick-and-mortar New Jersey location and its own online sports betting option. And FanDuel already is involved in Mississippi sports betting via a partnership with Boyd Gaming, whose casinos in Biloxi and Tunica have sportsbooks with FanDuel branding. DraftKings will have plenty of competition at its Scarlet Pearl casino site; nearly two dozen casinos in the state already have added a sportsbook to the menu, with FanDuel’s Biloxi site less than 10 miles away. DraftKings’ first deal for a brick-and-mortar sportsbook was announced in July, and it wasn’t in New Jersey or Mississippi. That deal was with del Lago Resort in the Finger Lakes region of New York State. 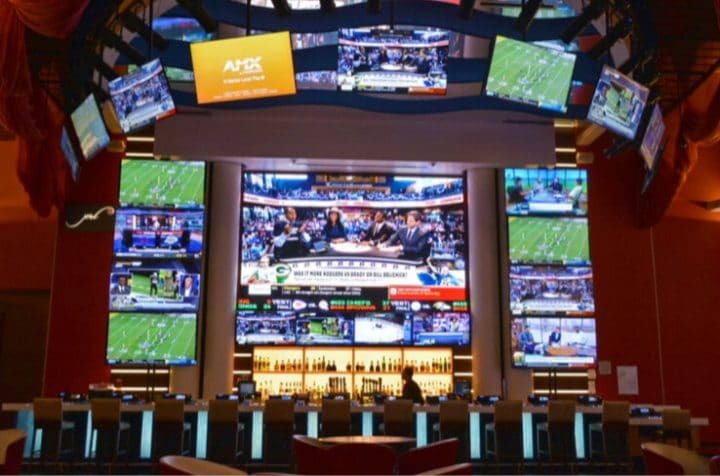 That is one of four new casinos in that state that are eligible to offer sports betting, but state officials haven’t yet gotten around to putting out the regulations necessary for the gambling to begin. Mississippi, like some other pioneering sports betting states such as Delaware, has elected to limit sports betting to casino or racino properties. It’s a curious choice, given the path set forward by New Jersey. That state’s casino industry went through an evolution almost a decade ago, doing a 180 from strongly opposing online poker and other games to supporting them, and that backing helped bring legal online casino gaming to New Jersey in 2013. The Atlantic City casino operators discovered — and this has been borne out over time — that the online bettor generally is not the same customer as the in-person one. Also, the creation of a second database of customers brings opportunities for cross-promotion: The casinos can teach the traditional customers how to set up their branded app on customer smartphones, and the at-home players can be incentivized to try a trip to a casino they otherwise would not consider visiting. Mississippi legislators passed a state law allowing sports betting in 2017, a year before the U.S. Supreme Court opened the door for any state to legalize the form of gambling. Their Pennsylvania counterparts also “jumped the gun” last year, yet residents and visitors to that state are expected to be gambling both at casinos and at home within the next month or two. There is some push to add online sports betting in Mississippi, a position to which a recent Op-Ed by a former Nevada Gaming Control Board member gave voice. Why the hesitation for online sports betting? Inertia seems to be slowing the online wagering effort in some states. West Virginia officials say there was such a frenzy to get the books operating at casinos and racinos that online betting just got pushed to the sideline initially. The September figures showed that while overall sports betting in the state nearly doubled to $184 million, the online portion increased fivefold, to $105 million. That was 57 percent of the total. If that doesn’t dazzle legislators in Mississippi — which saw its casinos take in $31.7 million in revenue in September — wait until Thursday. Several New Jersey online sports betting operators have October as their first full month of action. And through September, DraftKings, which now has a presence in Mississippi, was the runaway leader in the NJ online space. Within a few years, we should expect online sports betting to be offered in all states that legalize it. For now, let’s not be too hard on Mississippi and others. After all, even New Jersey politicians weren’t thinking about the internet when they asked voters statewide in 2011 to legalize sports betting at racetracks and the Atlantic City casinos. That also was true of the Sports Wagering Act of 2012 that followed the referendum. Yet when that very law was found by the Supreme Court to not run afoul of the Constitution after all, it was amended in June to include online sports betting — with not a complaint to be heard. The lesson probably is that laws are written by relative “old timers” who may not even be able to find the App Store with a digital map and a pair of millennial assistants. So they tend to focus on what they know: good old-fashioned casino and racetrack sites. That’s why it may take a shock to the senses — such as Thursday’s New Jersey revenue results — to jumpstart the process in countless states. There’s just too much money to be made from people’s smartphones, laptops, and desktops for tax-revenue-starved legislators to resist.